I have been using Freud blades on my table saw and miter saw and have been well satisfied. The cuts on the table saw had become less than smooth so it was time to either get the blade sharpened and tuned up or to replace it. Like most hobbyists I read about how great the Forrest blades are and I guess I have been yearning to try one out. As it turns out over the past day or two I have been spending money like crazy on my woodworking tools and I guess I must have crossed the just get what I want threshold. So I headed out to Woodcraft and talked to the guys there about the Forrest blades. I had intended to get the 48 tooth thin kerf blade but after some good conversation they convinced me to get the WW10401125 box joint blade. It is a 10”, 40 tooth blade, 1/8” kerf, alternate flat teeth #1 grind and I paid $149.99 + tax. Well I bolted this bad boy onto the saw as soon as I got home and tried it out on a piece of 6” wide X 1” thick ash. I cut off about 1’ and trimmed the other end, then I ripped about 1” off the edge. It was almost like the blade was eating the wood, hardly ant effort was required to push through. The cuts are absolutely terrific. There was no tear out on the cross cuts and the end grain is so smooth that it rivals the miter saw cuts with the 80 tooth Freud blade. Even though the rip cut was only a foot long the cut edge on both pieces is as close to perfect as it gets. $150 is a bunch of money to pay for a blade but I am glad to have it on my saw and I am looking forward to using it for years to come. I’ve had a 40t ww2 for over a year and a half and it still cuts like a champ. Yu, keep it clean and it just keeps cutting perfect! I did pick up there Forrest Finger Joint Set which also perform incredible! why did they recommend the box joint blade over the regular 40th WW II blade? They told me they used the blade on all of the table saws they teach classes on and it produced very good quality cross cuts and rips in addition to the flat bottom for non through cuts. They thought it worked very well as a general purpose blade. At this time my primary woodworking interest is small box building so a combination of short cross cuts and rips on the usual jewelry box woods is what I will be using it for. I really don’t know if I will be needing the flat bottom cut capability of the blade. I have been using my router to do those cuts. The blade is still brand new to me and the only cuts I have made were just to try it out. I think it makes a very clean and smooth edge. Only time will tell if I would be better served with the other blade. I’m a big WWII fan, started with a 40T and added a 48T. Excellent buys when on sale. I still have a triple set of Freuds (80T crosscut, rip, and combo) which also see a lot of use. 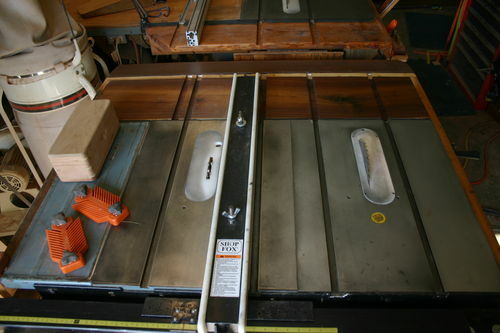 I use Forrest blades on all four of the table saws in my shop and on both of the chop saws. Some saws are set up with dado blades and one is set up with a flat ground blade for cutting corner splines in boxes. The idea is that I can cut a 1/8, 1/4, 1/2, flat bottomed dado with no set up time. It really speeds up my box making since I am set up for installing bottom boards, corner splines, or tops with no set up time. These are two Craftsman table saws that I bought off Craig’s list, reconditioned, and yoked together then added a Shop Fox fence. One is set up for 1/2 inch plywood the other cuts a flat bottomed 1/8 inch cut. 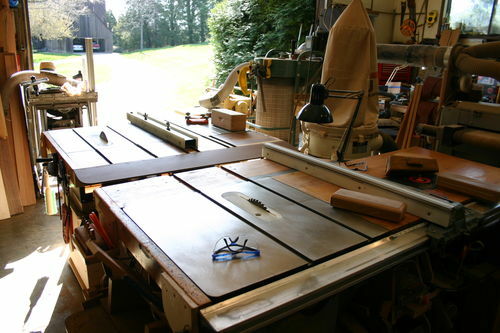 The yoked saws also serve as the off-bearing table for my Unisaw that I use for all my general work of sizing scraps and boards. The Forrest blades are expensive, but they pay for themselves in the long run with clean cuts, and they stay sharp much longer than other blades. I admire your setup Boxguy. I just bought the 48 tooth WWII and also believe it was money well spent. Noticeably quieter and as smooth a cut as you could hope for. You know I initially posted after making a few cuts in ash, since then I have used the blade to cut padauk and maple. I am not nearly as satisfied as I thought I was. Particularly on the maple I get burning on rip cuts and on cross cuts there is always a fuzzy edge. I know this blade says it is a box blade and it may very well excel at cutting shallow slots and possibly finger joints but at this time I think I would have been much better served with the regular WWII 40 tooth blade. Since this purchase I have bought one of the Freud glue line ripping blades and it cuts the maple without burning it. Charlie, When I cut woods like pakuk my blades get a coating of sap on them. This sap heats up the blade as it cuts and gives me the same results you are talking about. I have to soak them in 409 Cleaner over night and use a brass brush to clean the gunk off the blades. Forrest blades are an investment, but I still think they are worth it. I agree that you would be more pleased with a blade with more teeth. As I understand it, the box blade is made primarily for cutting dados and box joints. I don’t think it was designed to work as a single blade. It is too wide and has fewer teeth. Sounds like the guys at Woodcraft heard the word “boxes” and sold you a blade designed to cut box joints. Keep boxing and keep posting. I use both Forrest (40T & 48T WWIIs) and a packaged set of 3 Freud blades (FTG rip, combo, and 80T CC). They all serve me very well ( I haven’t used the Freud CC yet). The Forrest blades are spend, but once or twice a year they go on sale at various vendors, a bit over $90 for the 40T WWII and about $100 for the 48 (free shipping usually). The WWIIs ave a very shallow side grind which helps them get the glass smooth crosscuts. This has the side effect of them loading up with grunge quicker so keeping the teeth clean really helps over the long term. Thanks, the WWII blade does look like there is a little bit of black behind and below the teeth. I will get the brass brush and cleaner after it and see if it comes off. The Woodcraft guy probably did get side tracked by ‘box’ because they had several different blades in the cabinet and I was going to buy one regardless. Just as much on me too though, I asked for the standard blade and allowed the diversion to the box blade. Will probably stick with the Freud blades ordered from Amazon from here on out, I have been well satisfied with them and there must be a tool warehouse nearby because most of them are free prime same day delivery. This is an older post…. but as of March, 2017, I probably own 6 of these 40T Forrest WW2 blades. I have both the thin kerf and regular kerf. They all cost between 90~110 each. If you have a 3hp saw or bigger I would recommend the full kerf version because it’s just got a lot more carbon tooth. If you have a contractor size saw then the thin kerf takes a little bit less hp to cut. After owning the box blade for a decent amount of time I thought I would make one more follow up. When I bought the blade (after being encouraged by the staff at Woodcraft to go with this particular blade) I expected to use it as a general purpose do everything blade with the bonus of having a true flat bottom on non-through cuts. For the most part this blade is ok as a multifunctional blade, but as most of y’all already knew there are very good reasons for the various tooth configurations on saw blades. This blade does a really good job when I use it for the intended purpose. It cuts a very clean non through cut and with a backer board exit splinters are very minimal. It also does a very good job making half laps even though cutting them 1/8” at a time is painfully tedious LOL. This is a very good blade to have in the arsenal, but if I had a do over on buying a $$$ blade I would have chosen the WWII with the ATB tooth configuration because I mostly build smaller projects and use my router table to cut stopped dados and box joints. This is a very good saw blade and it does the job it is designed to do very well. This is a super blog about saw blades knotscott really knows his stuff.